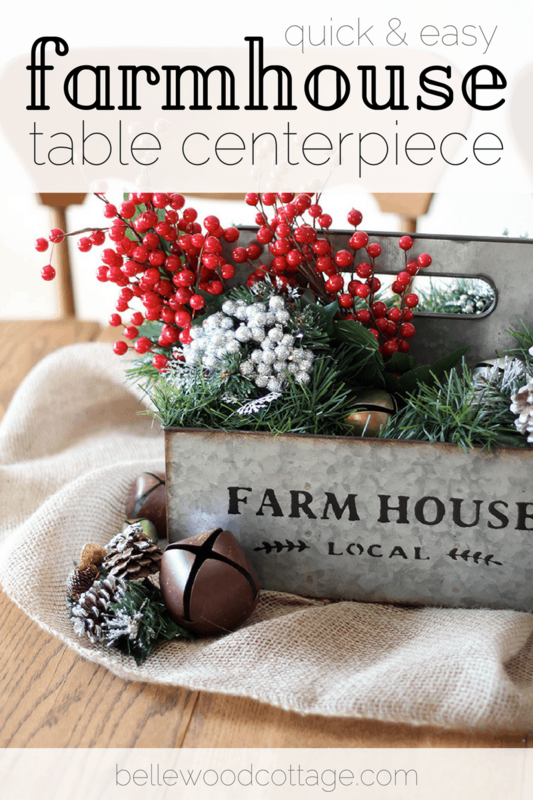 If you’re in need of a quick and easy table centerpiece for your Christmas festivities, look no further than this simple “centerpiece formula” I came up with. 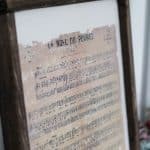 Even though a lot of the ideas seen on Pinterest are really fun and unique, many of us are looking for something more budget-friendly that we can create using items we already have around. Not to mention, it’d be nice if it didn’t take a whole afternoon to put together! 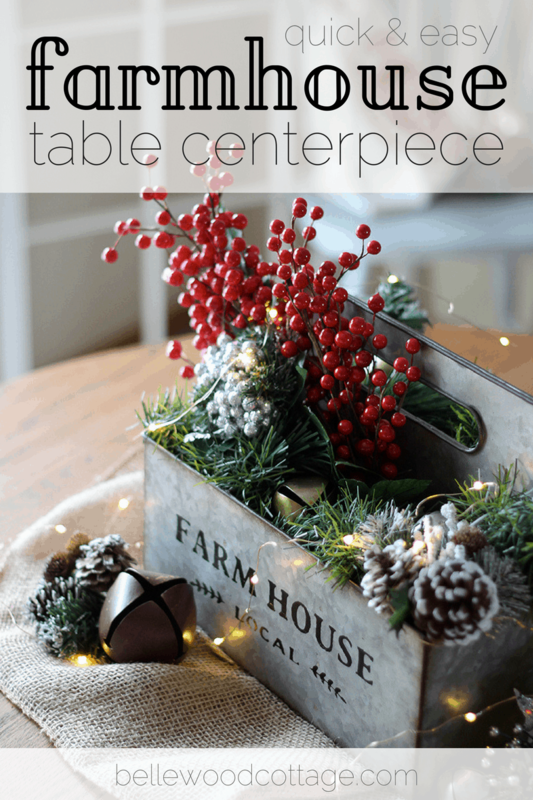 Try out this “centerpiece formula” with decor you already have at home and see what you can come up with. And if you give it a try, I’d love to see your finished tables! Vessel – I used a utensil container here from Hobby Lobby. You could also opt for something long and low, like the metal basket I made (see below). Try to avoid going with a piece that will block your guests’ view. Stuffing – we are in the business of quick & easy today, so no floral foam or other fanciness here. 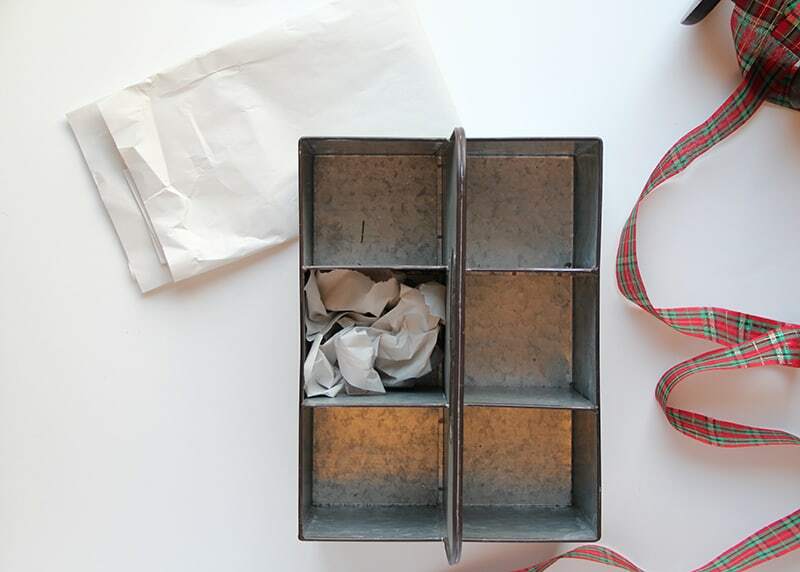 Instead, just grab some newspaper or the “wrapping paper” cashiers use to wrap glass/ceramic items in (tissue paper is great too, but you will need more of it). 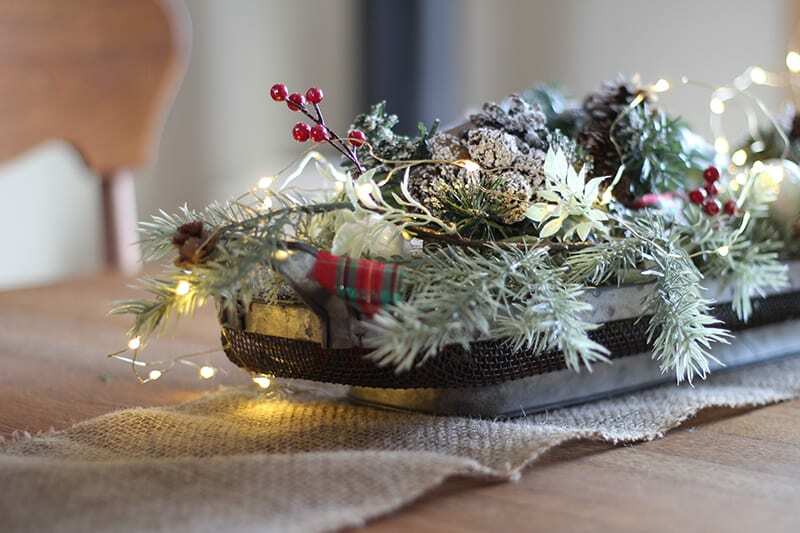 Greenery – use garland and/or artificial floral picks. 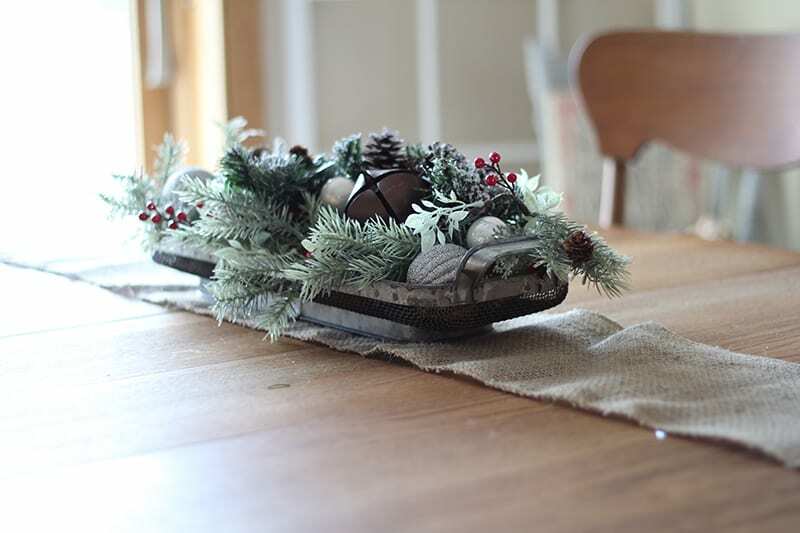 If using artificial garland, choose something that is flexible so it stays put as you arrange it. This is a great time to use any real pine you have around (cuttings from a Christmas tree etc. ), though be cautious for any fire hazards if you are wanting to add candles to the table. Really desperate? Polyfill stuffing is a great filler and looks like snow! 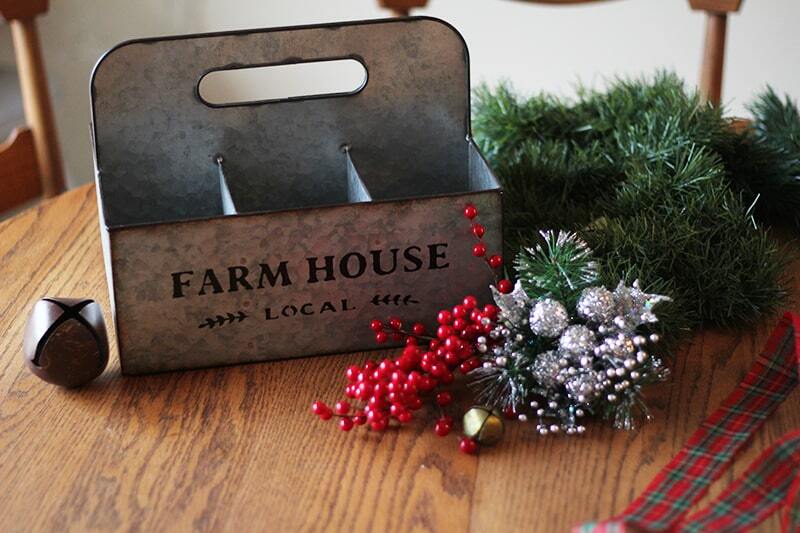 Accent item/s – this is where you pull out your favorite Christmas stuff. 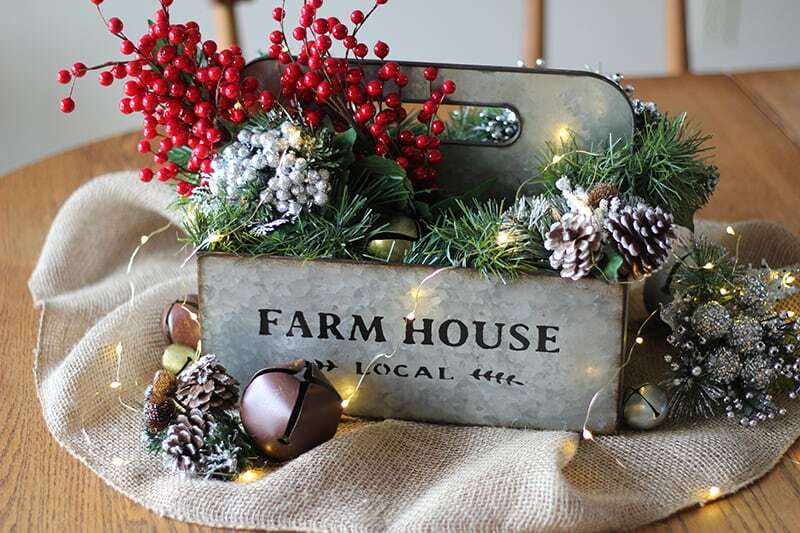 My accent items are the red berries (floral picks from Hobby Lobby) and the vintage-look sleigh bells. 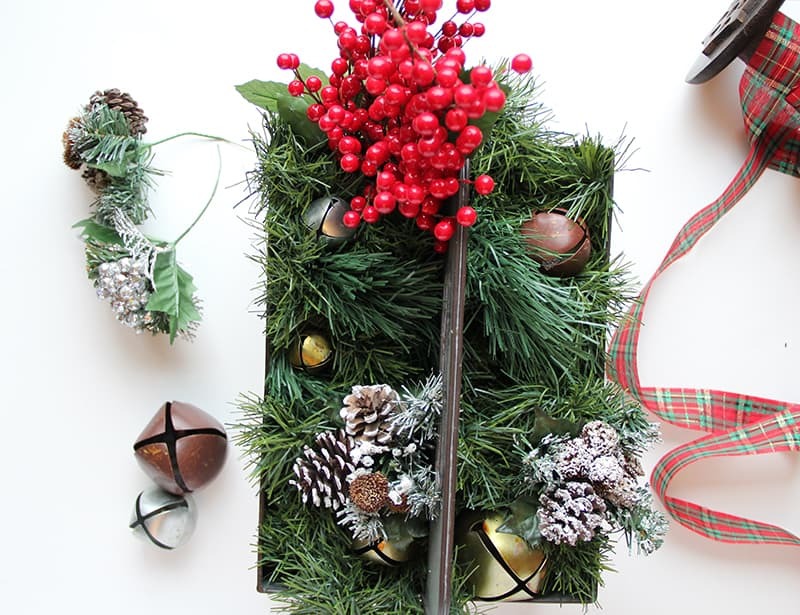 You could also incorporate favorite ornaments (stick with a color theme for continuity). Lights – optional, but adding in fairy lights or tea light candles is a great way to add some Christmas magic to the tablescape. 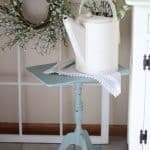 In this version with the metal basket, I used a 6-ft garland from Michael’s and just hid the ends with my accent items. Depending on how thick your garland is and how large your vessel, you may want to have two (or even three for very large centerpieces) garlands on hand. Begin by stuffing your vessel with packing paper. 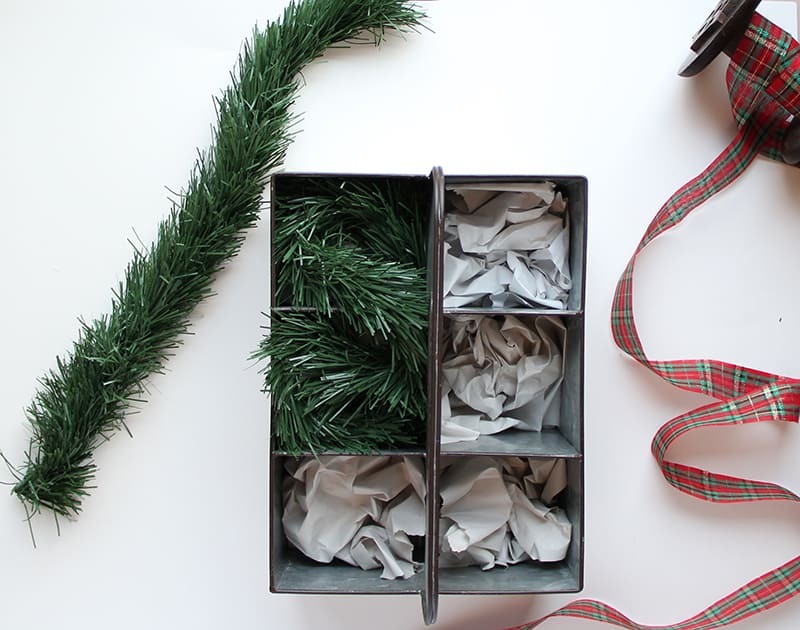 Add in your garlands by tucking and wrapping the garland in and above the paper. Hide the ends and then insert any additional floral picks (artificial is great) in and around the garlands. Arrange your accent items as you like, keeping in mind that choosing just a few colors will add to the balanced and cohesive look (for example, white + silver, or silver + gold + red). I was going for metallics (sleigh bells) + red here. And you are set! I added twinkle lights to this piece and in lieu of a tablecloth simply set it on some burlap I had on hand. The trick is to use what you have and go from there! Hope this is helpful to those of you that are hosting family and friends this Christmas! It really is a doable project, even if you are truly pressed for time. Don’t forget to share your creations with me if you give it a try and may you have a blessed Christmas! What a gorgeous centerpiece idea! I love the low one, too. Hi there! I'm Ellen and I'm passionate about making homes into beautiful places to share hospitality, create memories, and build community. Here you'll find me slowly transforming our little 1980's fixer-upper into a home that embraces a rustic farmhouse aesthetic (on a tight budget!). Annnd, if I'm not badgering my sweet hubby to help me with shiplap, you can probably find me baking a treat or reading as fast as I can.